Global Markets: Is Volatile the New Normal? Homeowners Ask: Hey, Washington, a Little Help? The government's effort to boost bank lending to end the credit crisis is hurting one of the areas critical to the nation's recovery: mortgage rates. In the past week, the average mortgage rate on a 30-year fixed home loan has jumped more than one half a percentage point to 6.74%, according to Bankrate.com. That might not sound like much, but it is the biggest one-week rise in the normally stable lending rate in 21 years. Some economists say mortgage rates could soon top 7%, a level they have not seen in more than six years. "Certainly the moves the administration have made so far are not directly attacking the financial issues that affect American homeowners," says John Vogel, a finance professor at Dartmouth's Tuck School of Business. "We need to refinance million of homeowners into affordable mortgages, and if rates go up that makes that job just much harder to do." Rising mortgage rates could also put downward pressure on housing prices, which have already dropped 20% since their peak in July of 2006, according to the S&P/Case-Shiller Home Price index. The increase in mortgage rates means that the average borrower will pay $1,296 a month in mortgage payment for a $200,000 loan. That's $100 more a month, and $1,200 more a year, than the same loan would have cost them a few weeks ago. For buyers on a budget, that means they can afford less house for the same amount of money. Conversely, sellers would have to drop their prices to attract that same buyer. What's more, a new "Adverse Market Fee" recently instituted by lenders for borrowers with less than perfect credit (regardless of the market) could raise the cost of a loan another half a percentage point  or an additional $70 a month on that same $200,000 loan  for nearly 20% of Americans. "For individuals looking to buy a home this is going to be just one more obstacle in their way," says Barry Ziggus, who tracks housing issues for the Consumer Federation of America. The story is worse for people in areas of the country, such as Scottsdale, AZ, or Glen Ellyn in suburban Chicago, where even modest houses can be in the $500,000 range. A $600,000 mortgage will now cost $4,319 a month, or nearly $500 more a month, and $6,000 more a year, than it did six months ago. Last month, when the government took control of mortgage giants Fannie Mae and Freddie Mac and pledged to inject $200 billion in capital into the home loan guarantors, administration officials said the moves would make it easier and cheaper for people to get home loans. Unfortunately, it hasn't worked that way. Mortgage rates fell sharply after the move, but soon reversed quickly, and are now higher than they were before the Fannie/Freddie rescue plan was launched. The problem is that other moves the government has made to render bank debt safer has had the unintended consequence of making Fannie and Freddie's bonds less safe by comparison. So Fannie and Freddie's investors have to be compensated for the increased risk. In particular, traders say, the move in the past week by the Federal Deposit Insurance Corp. to temporary offer unlimited deposit insurance for non-interest bearing accounts and guarantee roughly $1.4 trillion in new unsecured bank debt has caused a rush of selling of the bonds of Fannie and Freddie. That's because the FDIC's move makes bank debt more attractive at a time when traders are looking for safety. Sheila Bair, the head of the FDIC, was initially against backing this new bank debt, but eventually went along with Federal Reserve Chairman Ben Bernanke and Treasury Secretary Henry Paulson. Lower prices (and thus higher interest rates) for Fannie and Freddie bonds make it more expensive for the government mortgage guarantors to borrow, and that means that Fannie and Freddie have less money to purchase home loans. Which means a lower supply of capital available for mortgage issuers. 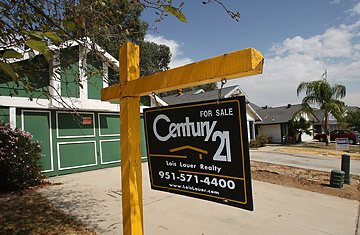 The result is higher mortgage rates for the average American. The higher mortgage rates have left some people wondering just what the government can do next. "Just what would you do differently," says John Weicher, a director at the Hudson Institute and a former assistant security at the U.S. Department of Housing and Urban Development. "I'm inclined to believe that the efforts we have made to help homeowners have been successful, they just haven't been enough." Click here to see how the mortgage crisis happened.